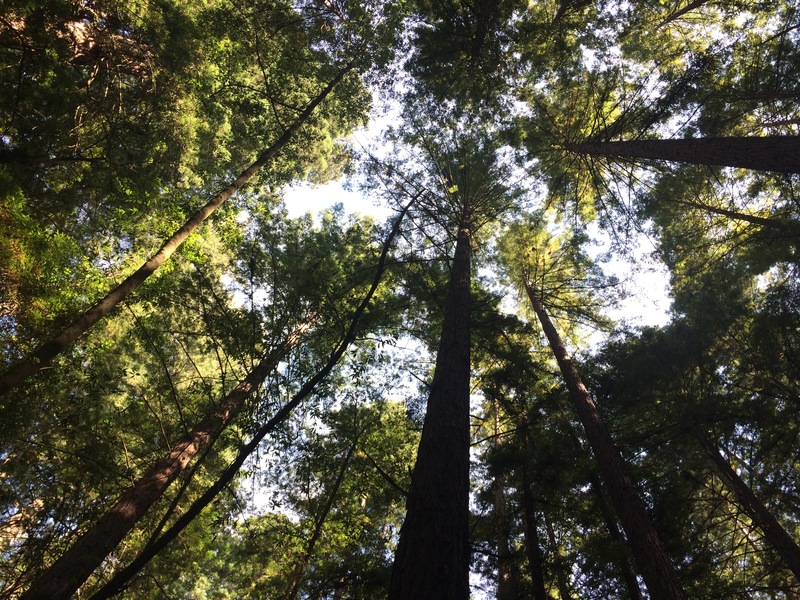 One of our travels this summer took us to California where we visited the astonishing giants of the Pacific Northwest – the great Redwood forest. Anyone who has been there can agree with me when I say it fills you with awe as soon as you enter the shadowy depths of quiet. The air is suddenly heavy with the essence of moist moss and it almost seems sacrilegious to make any noise in this cathedral of green. The soaring canopy of branches and leaves supported by their massively thick trunks invites you to gaze upward and dares you to look away if you can. 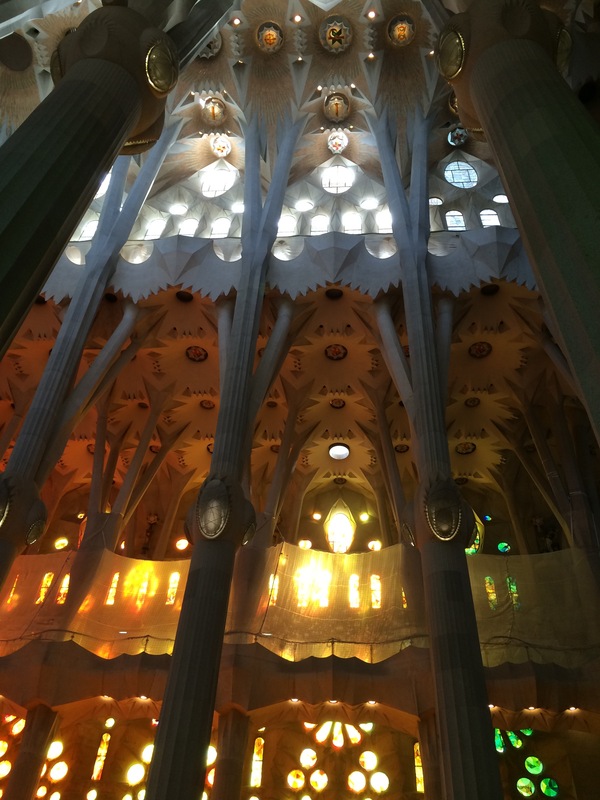 I experienced the same feeling of awe and wonder when I entered La Sagrada Familia (The Sacred Family) church in Barcelona, Catalonia (northern Spain). In my travels, I have ventured through the doors of dozens of cathedrals and churches in dozens of countries. But I was not prepared for what I saw in La Sagrada Familia. At first glance, the exterior is a complicated mass of ornate design that reminded me of the “drip” sand castles we used to make at the shore. But step inside and suddenly, a person feels immersed in a stunning masterpiece. 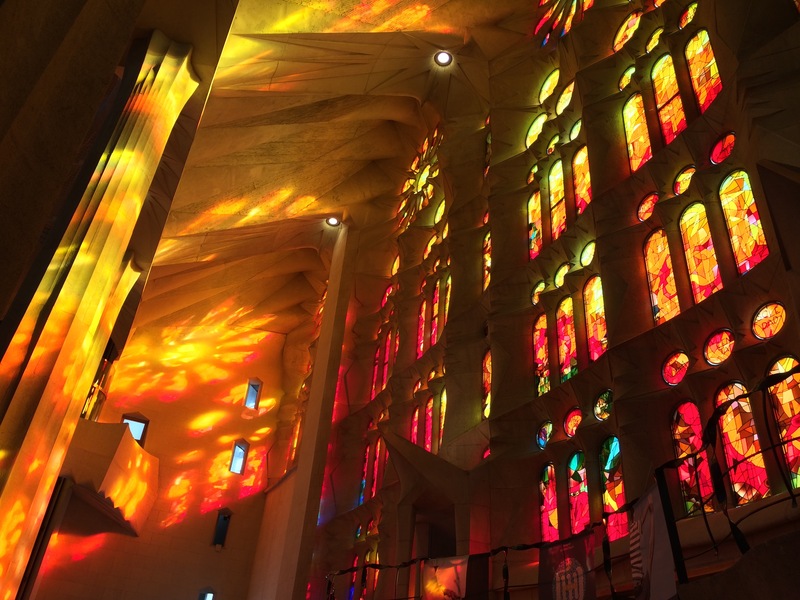 The first thing I noticed was the light – the play of colors on the walls from the strategically placed, enormous stained-glass windows. On one side (east) cool shades of blues and greens and on the other (west) vibrant reds, oranges and yellows. Our visit was timed for later in the afternoon so when we entered the whole cathedral was ablaze in an aura of glowing colors from the western sun. This is the masterpiece, in fact, the lifelong mission of one man, architect Antoni Gaudi. His unique Art Nouveau architectural style has been both heralded and ridiculed through the ages. I’m the first to admit his whimsical and sometimes comical-looking designs leave me at a loss for words. But I didn’t fully appreciate his genius until I walked into this church. 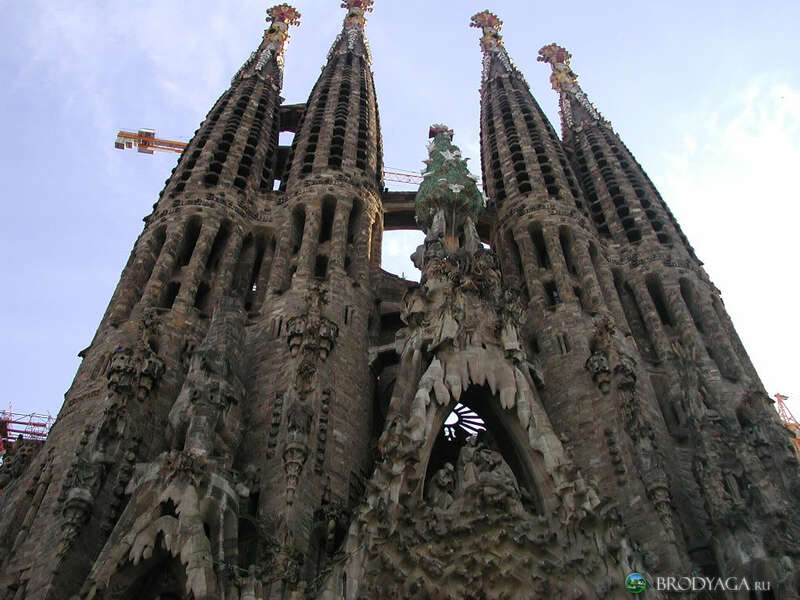 Gaudi began the work on the church in the late 1800’s and soon it consumed his life – 40 years of working, managing and living on site at the cost of his time, energy and finances until his tragic death in 1926. (In route to the church, he was hit by a tram car.) He was mourned by all of Catalonia and the mission of finishing the church was passed on to them. The mere magnitude of the project was unfathomable for the times and as yet is still unfinished, financed by private donations and the Catalan people determined to complete Gaudi’s dream of a church that would stand above all the rest in terms of architectural beauty and religious devotion to the Sacred Family. Gaudi was a deeply religious man and a passionate lover of nature – both of these qualities are reflected in the design of the church. The giant doors of the east Nativity portal are covered with bronze leaves from which peek out tiny hidden insects and reptiles. The giant interior columns rise up to a canopy of trusses that mimic the giant redwoods. The spiral staircase reflects the fluidity of water and wind, and many of the small windows are reminiscent of the perfect symmetry of a honeycomb. It’s clear to see the evidence of Gaudi’s many hours spent in the country observing, drawing and categorizing the tiniest details of God’s landscape around him. Gaudi’s own version of “slow food for the soul” was the culmination of his talents, time and resources offered, sacrificed and used up to satisfy his passionate appetite for his service to God. He died a pauper but left a legacy of inspiration for many generations to come. I wonder… what are my own offerings of service to God through the gifts he has so generously given me? Although I may not build a glorious church, what can I leave behind to inspire generations to come? 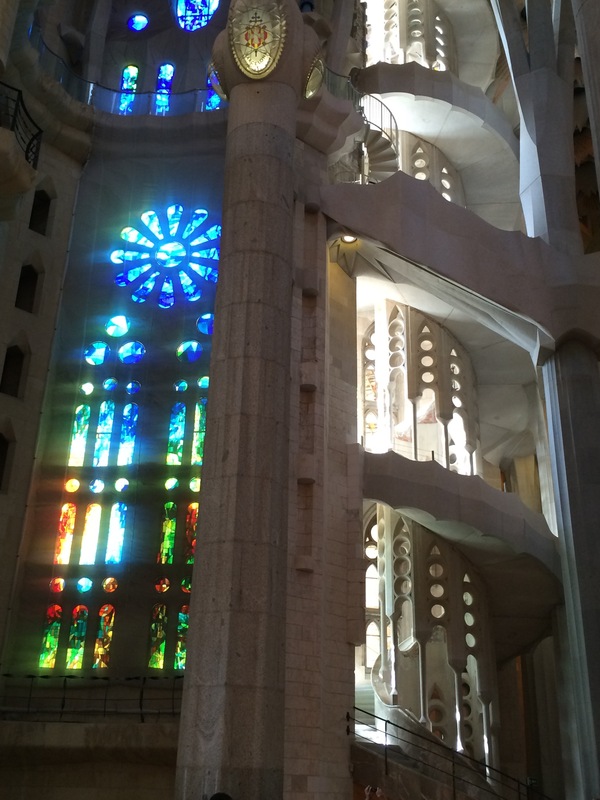 What beauty is there inside of me that would inspire and awe even more than Gaudi’s church? Perhaps the legacy is not in what we DO but who we ARE. I may never have an entry in Wikipedia, but my life well lived in service to God and others is better than any accolade I could hope for. God sees and knows everyone’s heart and that’s reward enough.